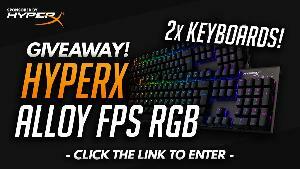 Contest: WIN: one of 2 brand new HyperX Alloy FPS RGB keyboards. WIN: one of 2 brand new HyperX Alloy FPS RGB keyboards. Prize: Overwatch Central and HyperX are giving away a total of 2 brand new HyperX Alloy FPS RGB keyboards. Statistics: This contest was opened by 108 and entered by 13 ContestChest.com members. 12% of those who opened the contest, entered it.